I ran the City2Surf. Yes, I’m better than you. Yesterday, I ran the City2Surf. For a city in love with itself (that hates itself), it’s the premier event to seek validation through very personal pain. Did I mention I ran the City2Surf? If you think Sydney has no soul, well, you’re wrong. Just wait until we do something for ourselves. Over the weekend, the athletic crisis that encompassed both of the aspects tourists to this city must see, the city and the surf, was held and yes, I was awarded a number. And yes, it was dangerously close to the amount of earth money I paid the running shoes I felt compelled to purchase for the occasion, but it didn’t matter. I finished the race and you didn’t. I caught the train back with a medallion draped around my neck, sponsored by a newspaper I don’t read. That was my Sunday. How was yours? The race that stops that stops the (brunch plans) of (one part) of the nation is ostensibly the magnification of the individual. The same individual that anonymously slogs on infinite treadmill mile while attempting to hook attention from those who do not pass them. We’re on the same track called loneliness. Reduced hopes alongside BMI. Dem gains of the body and well as the heart are kept out of reach. We’re dominating unheralded distance to prove that our love can do the same. 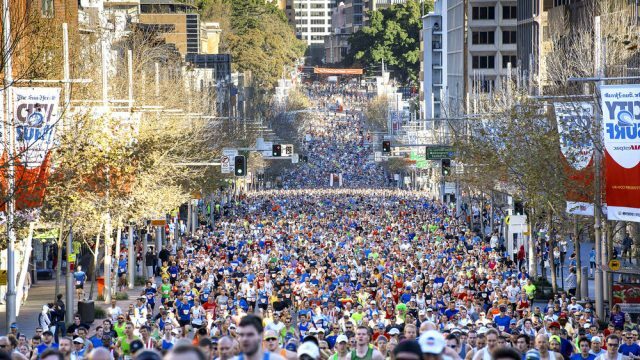 The City2Surf is Sydney’s primest prime meat market. The cattle are lead through the streets, ultimately to the romantic glue factory at the finish line: a suffocating bar in Bondi soundtracked my mumbled come-ons. So, uh, you ran the race too? It’s a moveable feast not designed for consumption. There’s nothing more than Sydney loves that a crowd. Something to part of, left out of, or despise your participation in. The wriggling participatory mass of ebullience mashed into activewear offers a denial to this. The faces are the same crowd we fight on a daily basis, as are the locations, but we’re venturing towards a meaningful goalpost, so it’s different. Passing under an inflatable gate in Bondi is much more different than the lobby that leads to your desk. It’s different. There’s an audience, so it’s the occasion to bring your Sunday best-pained smiles, forgot those Monday made-up scowls. You’re bringing us down. What time did you run, mate? Now, I won’t bore with my performance, because personal bests are a treasured thing. But I will say that I bested Tony Abbott’s time, which means I’m a bigger man than him, and thusly, more suitable to run the country. But it’s not about that. It’s about the human condition. It’s about validation masked by complaint, as the unison evoking of announced trauma is our war cry, look at us shaking fists at a hill for destroying our legs. Our effort is the antagonist. It’s because we put ourselves through this unnecessary trauma that we’re alphas of the city for today, and you will heed our presence. We just proved it. Read the medal. So, while we drone “Ohhh nooo, not the stairs”, we’re really asking you to look at our legs. Not our mouths, as KFC is at the top of our climb back, as we totally earned some dirty bird. This morning, you’ve no doubt met some of us. Those with the addled posture of octogenarians and smirked mouth of duck-faced teens. If you see us, don’t ask us how the run went. You should already know. It went great. Ow ow ow.